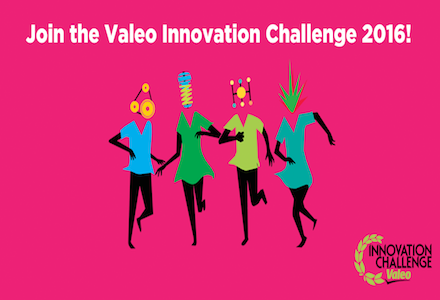 Enter for the 2016 Valeo Innovation Challenge For Students – Win €100,000! Students from around the world can now register for the Valeo Innovation Challenge 2016! Put your creativity, skills and determination to work by innovating to make the car of 2030 and the way it’s used more intelligent, greener, more intuitive and more fun! Two €100,000 prizes are up for grabs, so surprise us with your boldness, innovation and originality! The Valeo Innovation Challenge is part of Valeo’s innovation strategy, supported by the company’s annual Research and Development budget of over €1 billion. The contest is open to students worldwide who have completed their high school education, with one entry per person (same name and same e-mail address). Contest entrants must be able to travel outside their country of residence and possess, by October 2016, a passport that is still valid for six months after the date scheduled for the prize giving (October 2016). employees of the organizer, of any company that it controls, that controls it or that is under joint control with it, and their children. people who have been involved in organizing the contest, and their children. people who have a conflict of interest (especially interns and apprentices still working for the company). The second prize for each in these two categories is €10,000. Create a team of 2 to 5 students from any discipline and register here.